Competing in this summer’s Rio Games, Canadian athlete Rosie MacLennan became the first trampoline gymnast to successfully defend an Olympic title. The twenty-eight-year-old’s back-to-back gold medals trace back to an early introduction to the sport, as she started out on the trampoline at the age of seven (keeping up with a trio of older siblings) before beginning to compete internationally by the age of eleven. After her gold medal-winning performance in the 2012 London Olympics, MacLennan suffered a fall while training in 2015, with the resulting concussion leading to a period of rehab and recovery before she could begin preparing for the Rio games. Omegawave: What general physical qualities are the most important for performing at an elite level on the trampoline? Rosie MacLennan: In order to perform at a peak level, we need to have a lot of strength, a lot of power, and a lot of fast-twitch movement. We also need to develop spatial awareness and our anaerobic systems. OW: Is there anything specific you do to develop the explosive movements to gain height in the air and the “braking” and deceleration movements for control? RM: We do a lot of plyometric work, so eccentric and concentric squats, jumps… we do a lot of heavy-loaded squats so that we can control our power. We have to have a huge amount of core stability and strength because we need to be able to withstand16 g’s of force at the bottom of the trampoline, and if you’re a little bit off in terms of balance, you need to be able to correct that within a matter of .3 seconds. OW: How do you balance and structure the general strength training that you do with the specific skill and technique work that you do on the trampoline? RM: The balance between the two will change over time, but I usually spend about three hours with my strength and conditioning coach, and I spend anywhere from twelve to eighteen hours on the trampoline. They definitely complement each other—and on top of that, I also do Pilates and interval training to work on my anaerobic system. OW: When did you begin working with Sam Gibbs, and how have his training insights changed your approach? RM: I started working with Sam five-to-six months before the London Olympics. Before those games, it was purely rehabilitative—but I noticed that every time he treated me, I jumped higher. So I realized that he was definitely someone I wanted to keep in my corner. Going into the Rio games, he became the lead of my Integrated Support Team, so he did a lot of work in terms of developing strategy in trying to manage my systems, particularly when I was trying to come back from a concussion—making sure my systems were within tolerable range and pushing systems within a safe range. OW: Can you talk just a little bit more about what it took to come back from that concussion and what you needed to do to return to your competitive level? RM: It was a bit of trial and error, and there were a lot of different things that came into play. Focusing on the musculoskeletal aspect and the vestibular ocular aspect, and really trying to teeter that line on the safe side in order to be back on the trampoline in time to qualify for the Games. We were constantly evaluating where my systems were at and making sure we weren’t putting them into overdrive and putting myself at more risk of injury (or re-injury). Also, we were retraining the vestibular ocular system with eye exercises and going into something called the “bungee system”—which is essentially an adult-sized Jolly Jumper—and reducing the rotation and decreasing some of the forces so I was able to receive some of that information and stimulate the parts of my brain that were experiencing dysfunction, retraining those parts of my brain to be functional and tolerate more over time. OW: Once you incorporated Omegawave into your training, when did you take your measurements and were their particular indexes that you tracked? RM: I took my measurements every morning when I woke up. For me, I mostly looked at the graphic values and seeing certain patterns about what helped me take positive steps and my training and what might make it deteriorate—but Sam kept a closer eye on all the different values and he was the one interpreting the data. OW: Did using the technology help open any lines of discussion or communication with Sam? RM: He kept an eye on the readings and he probably kept eighty-percent of the information to himself and just gave me feedback using the technology and using the values that were provided through Omegawave. He definitely used it to direct the training advice and guidance he gave to me, and he was the one overseeing my entire “return-to-play” and preparation all the way into the Olympics. OW: When you did look at your own results, were there ever times you were particularly surprised by your measurements, where you were either feeling well but your biological systems were showing signs of stress and fatigue; or conversely, where you were maybe feeling less sharp but your Omegawave readings were green and indicated that you could physiologically benefit from maintaining your planned workout? RM: There were some discrepancies, but the way I understood it the readings were more of an assessment of what would happen as a result of that training. In training, I definitely used Omegawave to gauge where I was at, but at the same time, on competition day you have to be ready no matter what. On competition days, I didn’t actually look at my results, because I didn’t want to be psychologically impacted by it. For training purposes, though, it was definitely useful and interesting, because there were some days where I had some of the measurements in the yellow and even one or two in the red, and was able to perform. But then I noticed there were some days where I was full-on green and was performing at a lower level. But we found those patterns over time, and realized that the main measurement we really looked at was the central nervous system and how that was functioning in relation to my training. It was really interesting to see that some days after hard workouts I would still be in the green, which allowed me to push harder the next day when I would’ve thought I might need a lighter training day. OW: Turning specifically to this year’s Olympic Games, how did you approach issues like travel fatigue, nutrition, and sleep? RM: It was really a matter of finding the patterns of what would make me feel ready and prepared mentally and physically on the day of competition. I learned over time the state that I needed to be in to perform at my best, and looking back on it, Sam showed me some of the graphs and charts and showed that we really did optimize the preparation leading in to the games so that I did peak on the right day, even with my Omegawave measurements. He used Omegawave really to tailor his guidance to me, and from my end the results and measurements were a bit behind the scenes, but I knew I was being guided by what he saw. OW: With back-to-back Olympic gold medals under your belt at the age of twenty-eight, are you planning to compete in the 2020 Tokyo Olympics? RM: I’m planning to continue training and I’ll be ramping back up in January. I’m kind of dabbling right now, but I don’t feel done yet. 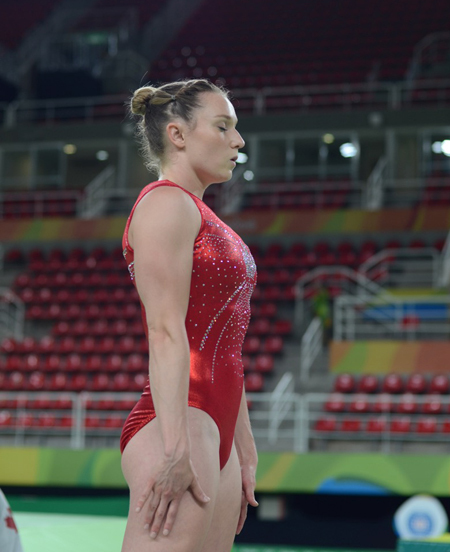 Because I didn’t have the length of preparation that I would have liked going in to the Rio games, I didn’t actually compete the routines that I wanted to. I definitely think there’s room for improvement and I definitely don’t feel I’ve reached my peak yet. So I’ll keep jumping until I feel like I have.